Preheat the oven to 200C, gas mark 6. Heat the oil in a frying pan and add the chicken. Fry for 5 minutes until lightly browned and just cooked through. Drain on kitchen paper and arrange in the bottom of a 2 litre ovenproof dish. Steam the broccoli over a pan of simmering water for 3-4 minutes, until almost tender. 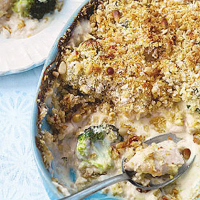 Arrange over the chicken and spoon over the cheese sauce. Mix together the breadcrumbs, pine nuts, Parmigiano Reggiano and cayenne. Sprinkle over the top of the bake and dot with the butter. Bake for 20-25 minutes, until golden and bubbling. Serve with new potatoes.